BHIM is a digital payments solution app, for easy and quick transactions, based on the Unified Payments Interface (UPI) from the National Payments Corporation of India (NPCI). 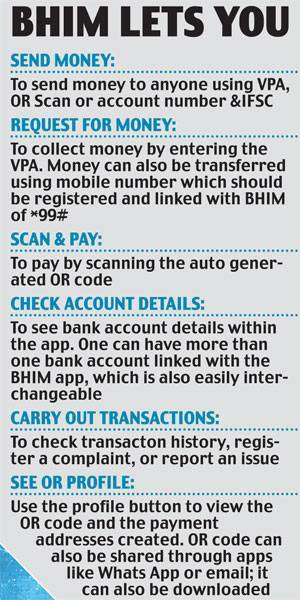 The Bharat Interface for Money (BHIM) mobile app, launched on December 30, 2016, in a bid to make digital financial services available to all, has emerged as one of the fastest growing apps. Within 10 days of launch, it has seen one crore downloads, and over 20 lakh transactions across the UPI (unified payments interface) and USSD (unstructured supplementary service data) platforms. While it is a big step towards digital inclusion, how different is it really from the existing digital payments systems? 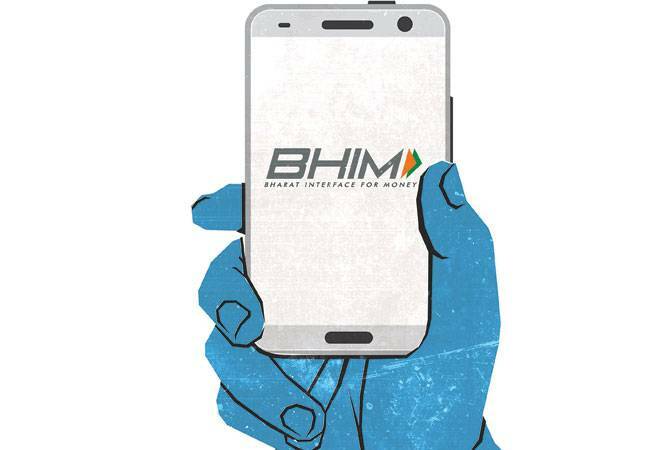 Those who have signed up for UPIbased payments on their bank accounts, which are also linked to mobile phone numbers, will be able to use the BHIM app to carry out digital transactions. One can easily make direct bank-to-bank payments instantly, and collect money using just a mobile number or payment address. It allows person-toperson money transfers, scheduled money collection, and transactions to be done through a smartphone. Payments can be made across all participating banks (35 in total). To make transactions using UPI, one does not require an account number, or bank details, all transactions can be done using the VPA (virtual payment address) created within the banking app. The highlight of the BHIM app is that all the UPI transactions are combined into a single app -people need not download different UPI-linked banking apps to make transactions. Other than sending, receiving, and requesting for money, one can also check their account balance and switch between accounts in case they have multiple bank accounts. Money can also be sent to non-UPI supported banks using IFSC code and account number. It supports only Hindi and English languages as of now unlike other mobile wallets that support regional languages, too. BHIM is available only on Android via Google Play. Those without access to data services, can use BHIM by dialing star99hash (USSD-based mobile banking service) on their phones. UPI-linked apps such as PhonePe and Trupay enable transfer of money without sharing any details, using only the mobile number, provided the receiver also has the same app. People can pay their utility bills, purchase gift cards, and share expenses among friends using these apps. But when sending money using the BHIM app, the amount will go directly into the receiver's bank account irrespective of whether the receiver has the BHIM app or not. "BHIM is a skeleton of what UPI does, which is sending and receiving payments. Trupay starts where BHIM stops; it provides value-added services over and above what BHIM does," says Vivek Lohcheb, Co-founder of Trupay. Level of authentication: Wallets mostly rely on a phone's locking system as their security system. Even while making a payment, wallets often don't ask for any kind of pin or password. So if the phone is stolen, anyone can make transfers using the wallet by merely unlocking the screen. The BHIM app, on the other hand, has its own app password. One needs to enter the password to access the app, to proceed with a transaction, and also to check balance. The payment gateway is blocked after three wrong tries. However, with BHIM allowing just the name or mobile number as payment address, anyone can request for money. The NPCI has cautioned people about unknown payment requests one may get. There have been a few updates and 'bug fixes', but it is not known if the issue has been resolved. Charges and limits for transferring money: To use wallets for making payments and transfers, one needs to fill them with money first. The amount sent and received stays in the wallet account itself. To make transfers from a wallet to a bank account, a processing fee of 1-4 per cent per transaction is charged. With BHIM, one can directly send, receive, and request for money to and from their bank accounts. There is no need to fill up any wallet to proceed with a transaction. For those using star99hash, Rs. 0.50 is charged per transaction. It is the bank's discretion to levy charges on the customer for using BHIM; from NPCI, there are no charges levied. With wallets there is a maximum transaction limit of Rs 1 lakh per month. Transaction limit using BHIM is Rs. 20,000 per user, per day, and Rs 10,000 per transaction. The limit for USSD has currently been set at Rs. 5,000 per day. It has come as a huge advantage for merchants who can now accept payments directly into their bank accounts, and pay no transaction charges, unlike on wallets. Bank transactions and transfers through BHIM happen 24X7. Perks: Offers, discounts, and cashbacks are what draw users towards mobile wallets. In keeping with this trend, NPCI has come up with its own lucky draw schemes - Lucky Grahak Yojna for consumers and Digi-Dhan Vyapar Yojna for merchants. Lucky Grahak Yojna will give out Rs. 1,000 daily for 15,000 customers, and a weekly prize of Rs. 5,000, Rs. 10,000, and Rs. 1 lakh. Digi-Dhan Vyapar Yojna will give away a weekly prize of Rs. 2,500, Rs. 5,000 and Rs. 50,000 for merchants. Users of RuPay Card, USSD, BHIM/UPI and Aadhaar-enabled payment services are eligible for these daily and weekly lucky draw prizes. Mobile Wallets at a Loss? BHIM app is not a mobile wallet; it is an open platform which links directly to any bank account and proves to be much more useful than mobile wallets. "UPI being a more efficient platform from a user or merchant point of view, it will overtake wallets in no time now. Wallets will exist till they keep giving cashbacks. In the long run, wallets will not exist in India," Lohcheb says. Wallets have a few shortcomings. Only a fixed amount of money can stay in a wallet app, unlike BHIM. Wallets do not allow users to send or receive money from different mobile wallets; whereas there is no such restriction within the BHIM app as it uses UPI.